PAC Recording Studio, the recording studio of reknowned percussionist Dudu Tucci, is located in Percussion Art Center (PAC), his school and meeting place for percussion, dance, and singing. Since 1999, it has become an important attraction for musicians at home and abroad. Dudu Tucci's personality has played no small part in PAC's international reputation - he has poured his own experience from 6 CD's into the studio and worked together intensively with the sound technicians. The fully digitalised studio offers ideal conditions for all types of recordings, from demo-tape to high-quality CD-Master. The sound technicians operate with state-of-the-art technology and have a lot of highly specialized experience in the area of latin music, percussion and recording work with large formations. 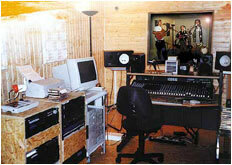 In addition, four different recording rooms can be used - from the 4 m2 cabin up to the 160 m2 room. attended the SAE (School of Audio Engineering) Berlin and received his diploma in audio engineering. Already during his education he worked in various areas of sound technology, especially in live music. Today he teaches practical training at the SAE Berlin, works at Radio NRJ and at PAM Events. He started working together with Dudu Tucci in PAC.and together they created the concept and built the recording studio. Rodrigo is responsible for the technical side of the studio and, as "House Engineer", maintains the studio and supervises all the recordings. learned to play a number of musical instruments and played in various bands in Freiburg, Germany for several years. Today the piano is his most important instrument. He has been working at the recording studio at Percussion Art Centers since his audio engineer training at SAE Berlin. His specialised work was the "New Microfone Technology". He also focuses on composition of film music, sound design and sound restoration, as well as recording noises. He has experience with Pro Tools and Logic Audio. Because of his extensive studio experience with the production of six of his own CD's and as a guest on many other productions, mainly percussion, Dudu likes to offer his support during recordings with tips and advice. Anastácia Azevedo, Dudu Tucci, Vereda, Caipiranha, Sambodromo, Afoxé Loni, Bloco Calango, Andreas Weiser and Paran do Bonfim.